In the fall on 1939, Joseph Stalin decided to "liberate" the people of Finland, and he sent an army to invaded that small country. In response to this act of aggression, Finns of all ages became soldiers, nurses, plane spotters, messengers, and spies. Marko and his best friend Johan join the Civil Guard and one of their jobs is to be sky watchers. The two boys are up in the church tower one morning when they see planes heading their way. Because he had polio Marko cannot run very fast, so Johan jumps onto his bike and races to sound the alarm. As Marko follows his in his friends wake, the planes seed the town with bombs. To his horror Marko discovers that his dearest friend was one of the casualties of the bombing. Some months later, one of Marko's old school teachers turns up at the hospital after being wounded at the front. He offers Marko a job as a messenger, and wanting to do his part for Finland, Marko agrees to go. Marko is shocked by the conditions at the front. He and the other messengers and soldiers have to put up with the bitter cold, lice, poor food, being shelled by the Russians, tank attacks, and the constant nagging worry that they will not be able to hold their line – which it is vital that they do. They have very few weapons, few tanks, and their soldiers are greatly outnumbered by the Russians. Two things that they do have is a lot of skill in getting around unseen on skies, and the fierce Finnish winter. Despite his far from perfect leg, Marko does well as a messenger. He skis fast, works hard, and earns the respect of the men around him. He also makes friends with Karl, a teenager like himself who has lost a great deal since the Russian invasion. Every day Marko worries about what will happen if the line is not held. If they fail to maintain the line will the whole of Finland fall into Russian hands? 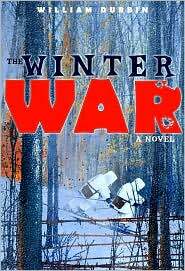 In this very moving and often distressing book, young readers will find out what it was like to be in Finland during the Winter War. Finns of all ages, including young teenagers like Marko, joined the fight against the Russians, and despite their vastly inferior numbers and inadequate armaments, the Finns stood their ground. This book is a fitting tribute to all the Finns who fought against the invaders, whether it was by taking up a gun, serving as a nurse, or working as an errand boy. Seeing the war unfold through Marko's eyes, readers will come to appreciate how terrifying and painful war i,s and how devastating it is to the hearts and minds of those who experience it.